It is illegal for any company to apply insecticide as part of there contracted work without being certified. 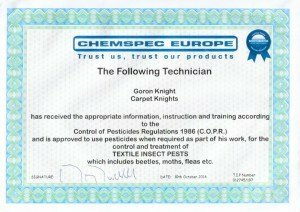 Carpet Knights are trained and certified in applying insecticide treatments. The certification gives us access to professional quality products which are more efficient and effective.